Home ♦ Coffee ♦ What is Cuban cafe con leche? What is Cuban cafe con leche? A cafe con leche in just about any coffee shop is coffee with milk. The ratio varies from coffee shop to coffee shop, but when I think about cafe con leche, I think about Cuban cafe con leche. Cuban coffee is strong and can be made a variety of ways – stovetop espresso pots spring to mind as a classic example, but I’ve seen it brewed right in a saucepan and had the grounds strained out, too – but it ends up being much like a long shot of espresso. A Cuban cafe con leche is essentially steamed milk with a bit of Cuban coffee in it and maybe a little sugar or sweetened condensed milk to sweeten things up. It is an inexact definition because everyone makes it a different way, but it should be enough to give you the idea – and the idea that it is just a bit better than your standard latte. 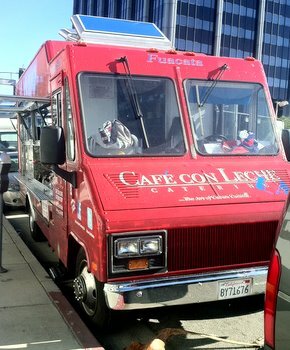 This particular cafe con leche came from a Cuban food truck in Los Angeles of the same name. 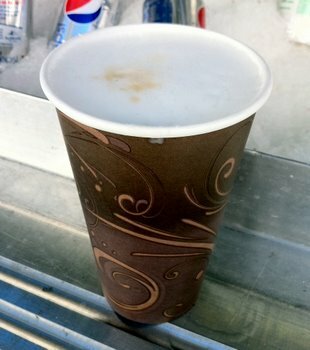 It’s not often that I find cuban cafe con leche and I jumped at the chance to pick one up in my neighborhood. It was delicious and perfectly sweetened, just enough to make the milk seem sweet without taking the edge off off the coffee.